AV rated by Martindale Hubbell (1988) Alumnus, Focus Louisville 1987, Leadership Louisville 1988, and Bingham Fellows 2000. 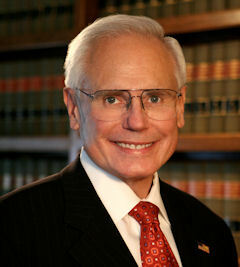 Charlie Ricketts is a Trinity High School graduate whose undergraduate degree was won at Bellarmine University and whose undergraduate law work was accomplished (J.D.) at the U of L Brandeis School of Law. Post Graduate studies were performed at George Washington University while Charlie was assigned to Washington, D.D. as a Special Agent for the FBI. While a FBI Agent, Ricketts was assigned to Minneapolis, Minnesota, Sioux Falls, South Dakota and the Nation's Seat of Government, Washington, D.C. His work in the Bureau included counter-intelligence, anti-terrorism and criminal prosecution including “white collar” investigation. Ricketts' transition from these varied assignments was facilitated by skills he acquired as a radio and TV. News reporter at Louisville stations WAVE AM and TV before becoming an agent. Upon his return to Louisville and while reestablishing himself as a lawyer and trial advocate, Charlie was appointed 1st Assistant commonwealth Attorney, prosecuting the City's high profile cases. At that same time in his career and for in excess of 20 years, Ricketts served on the Adjunct faculty of the University Of Louisville School Of Justice Administration and its non-accredited component Southern Police Institute. Also during those years, Charlie was appointed attorney for the City of Jeffersontown, assisting during that municipality's industrial growth phase. A significant part of then a fast developing practice consisted of zoning, municipal planning and ordinance drafting. All of these experiences have formed the professional advocate and advisor Ricketts has become and from which he daily draws as he practices in all of the Courts of Kentucky, from “District” to “Supreme” levels. At the Federal Courts he practices successfully at both the trial and appellate levels. Coal Mine law cases, along with Mine Safety and Health Administration matters, at both the Federal Court and Administrative Law level, are frequently handled referrals typically for management and ownership clients. As a litigator and as a general practitioner Ricketts well understands that to practice such a wide spectrum of the law, constant continuing legal and other education must be pursued, from even before Kentucky's Supreme Court adopted a mandatory CLE requirement Charlie annually accumulated CLE credits well in excess of any required level of such continued education and has, from the adoption of the CLE Rule, each year, won the KBA's CLE Award. He lectures at these programs on a frequent basis as well. To be an effective representative for his clients, an attorney must know and be respected by his colleagues and the Judges before whom he appears. Ricketts knows this and has been an active Bar leader for the entirety of his career.